Kelsey and Travis know how to have fun. 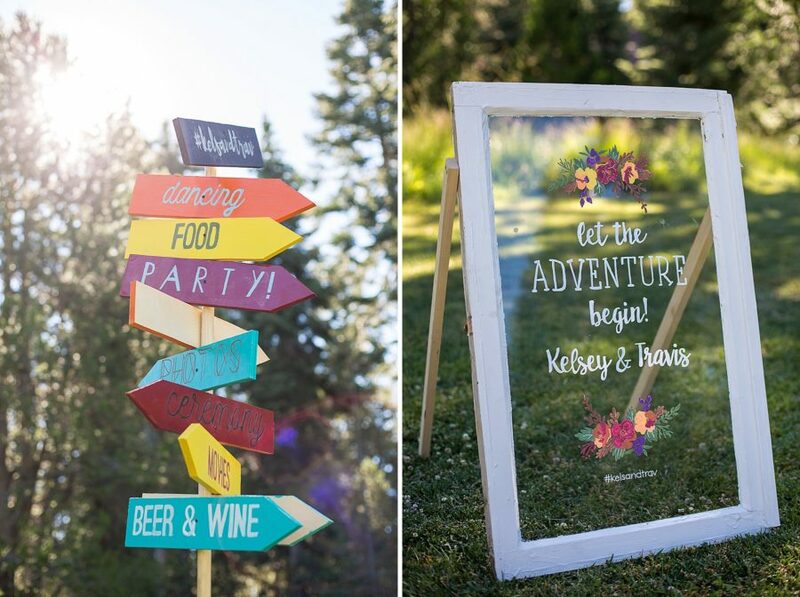 This adventurous duo was married in Lassen Meadows Ranch last summer in the company of their friends and family, and we loved being part of it.They rented the whole property out for the weekend and provided games like the 5k fun run, volleyball, movies, lawn games and meals each day. 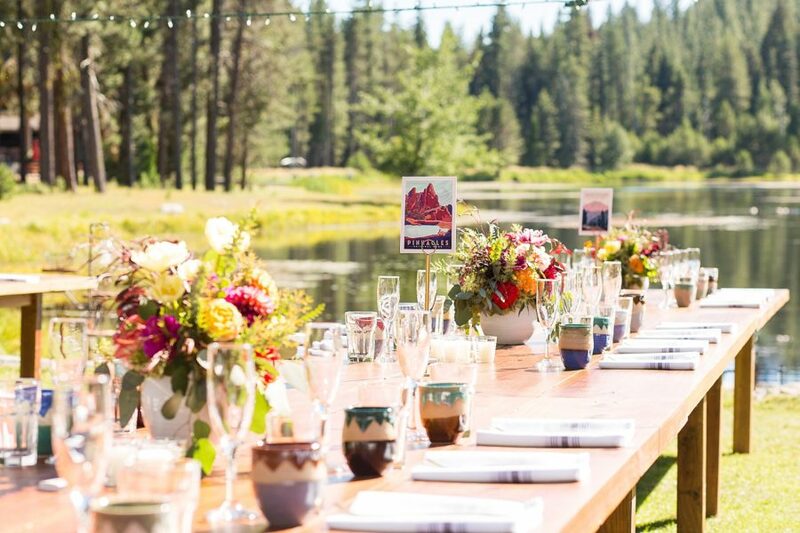 We were thrilled to hear this outdoorsy, easy-going couple wanted meals that were unique, memorable and matched the casual, campout feel they had envisioned. We wanted to create a 3-day menu that was packed with flavor without being too formal. They wanted to provide a variety in a way that their guests would have a different experience each night. Our imaginations ran to fresh and festive recipes. The first two days were fully customized to their favorite foods, including Southern soul food and mediterranean cuisine. On the last day we wrapped things up with some fresh and simple brunch classics. The atmosphere was so welcoming and laid back, with all the guests settled in for a full weekend of mingling, games and having nowhere else to be. We prepared a Southern style BBQ for about 100 people, most of whom were from San Francisco or a bigger city and were enjoying their first camping experience. While the venue provided all the amenities to ensure the guests’ comfort, it was neat to be in an environment where everything was new for everyone. The first night we got there 6 hours early, met Camelot Party Rentals and got settled. Camelot set everything up with a farm table feel, and it couldn’t have been more picturesque. For the reception dinner, Kelsey and Travis wanted the main meal to be more higher end while still fitting the casual environment. We prepared a Mediterranean-Israeli themed menu—one of their favorite styles of food. They are huge travelers and lovers of the outdoors (in fact at this very moment they are currently hiking the PCT!) so memorable was key for them. They wanted this day to be an exciting, fun experience for their friends, to get to do things they had never done before. It was beautiful. Mt. Lassen still had snow, next to the lake with bald eagles flying over it. There were even a few bear sightings. As the morning eased into afternoon, things started to heat up, literally. There was supposed to be a full kitchen but it wasn’t finished in time. Luckily we had prepared with our van full of ice chests—although we ended up changing out the the ice several times and using the bridal parties cabin for day-of food preparation. Despite the heat and kitchen obstacle, everything went down as smooth as a summer cocktail. 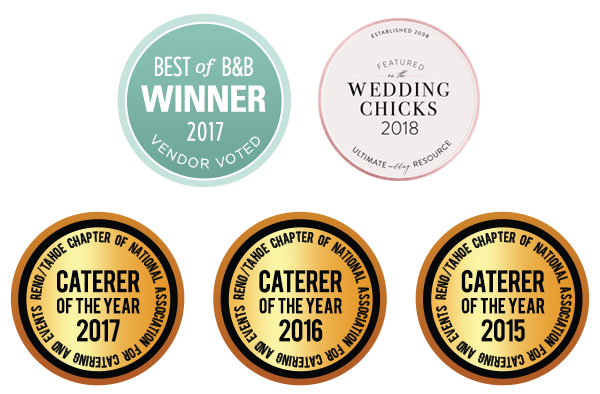 Throughout the day we provided a full spread of appetizers, several stations held platters cured meats and cheeses and we also had a popcorn station. There was something for everyone. The challenge: the bridal party cabins were a solid walk from the ceremony and reception areas. We ended up walking 14 miles that day, lugging ice and food back and forth. We felt like the real life Jack and Jill, only it was way less whimsical and no one got hurt. 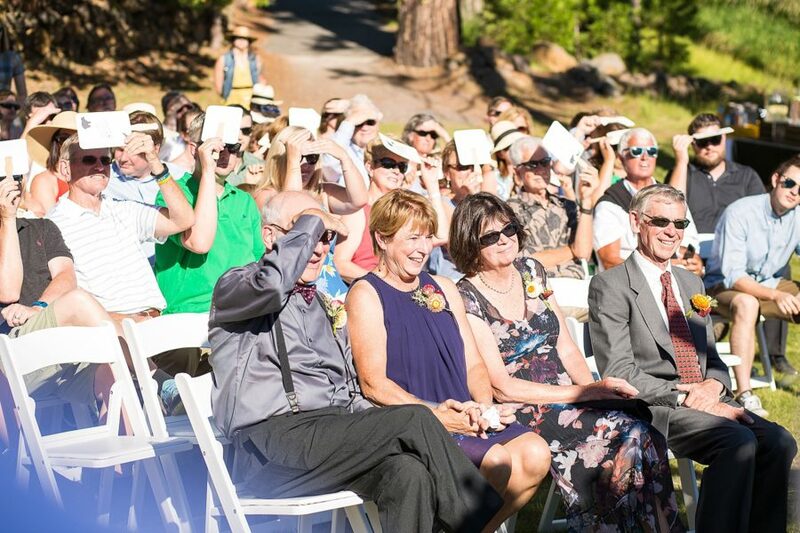 Of course it only got warmer by the ceremony, and with 200 people, we knew we were going to have a real challenge keeping everyone hydrated and happy. Thankfully the happy part was never an issue. The guests were so amazing and totally easy-going. After the ceremony we set up a water station with lemonade and iced tea, but there was no way to refill the water, so we were running to refill whatever we could in our hands and running back. 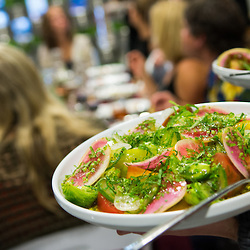 We prepared a huge Israeli salad, with all local ingredients from a farmers market that happened to be right on Lake Almanor in Chester, California. The bride’s rockstar friend and wedding coordinator also owns a doughnut place in San Francisco, so we helped her serve them for dessert. She was great coordinating the bride and groom, and she was a major part to all the easy vibes and vendor collaboration. Later that night, during the dancing hours, we hit the floor with some late night snacks of assorted flatbread pizzas while everyone danced. By the last morning, the guests were ready for a fresh and simple brunch as they said the’r goodbyes to the new couple. We provided brunch for the remaining 100-125 people—a spread of granola, yogurt and fruit, along with bagels, an array of cream cheese spreads and a full juice bar with bases for mimosas. 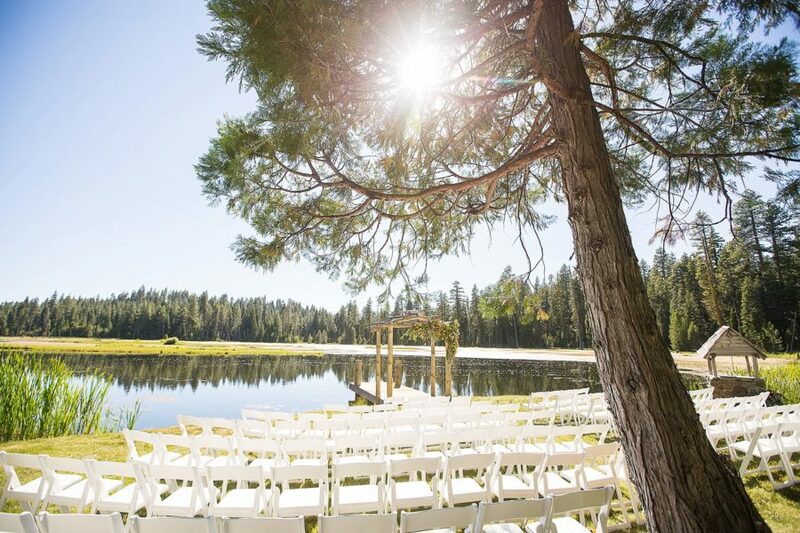 Everyone had an AWESOME time, and we were absolutely thrilled to work with Camelot Party Rentals, Bergreen Photography, and Lassen Meadows Ranch to create and truly memorable weekend for the couple and all their fun-loving guests.